So . . . last week, we had three long-term hearings on the schedule. This coming week, we have six more. What is a long-term hearing? When the school has exhausted all other responses to a student’s bad behavior – both consequences and interventions, or when a student has committed a serious-enough violation of the Code of Conduct, he or she is suspended for five days during which time a hearing is scheduled. In our school, the assistant principal in charge of our school-wide discipline program proposes the student be suspended for the remainder of a semester. The principal (that’s me) acts as hearing officer, to determine whether the student is committing behavior violations that necessitate a long-term suspension. For years I dreaded hearings. 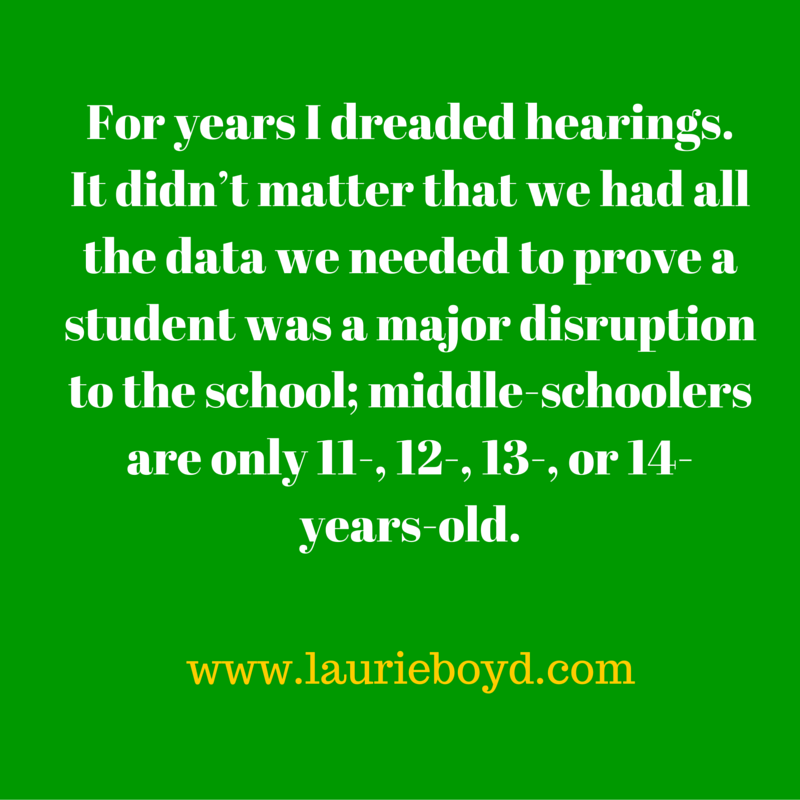 It didn’t matter that we had all the data we needed to prove a student was a major disruption to the school; middle-schoolers are only 11-, 12-, 13-, or 14-years-old. Being out of school and at home, or on the streets, at these young ages is never a desirable outcome. But allowing a student to return to school when you have exhausted all behavior supports and placements just sends the message that we won’t really take any serious action when students repeatedly violate the rules. This means the child won’t change, and that means he or she will continue to cause havoc in the classroom or hallways, hurting and inciting others, refusing to work, disrupting classes, undermining adult expectations, and doing whatever he or she wants to do. 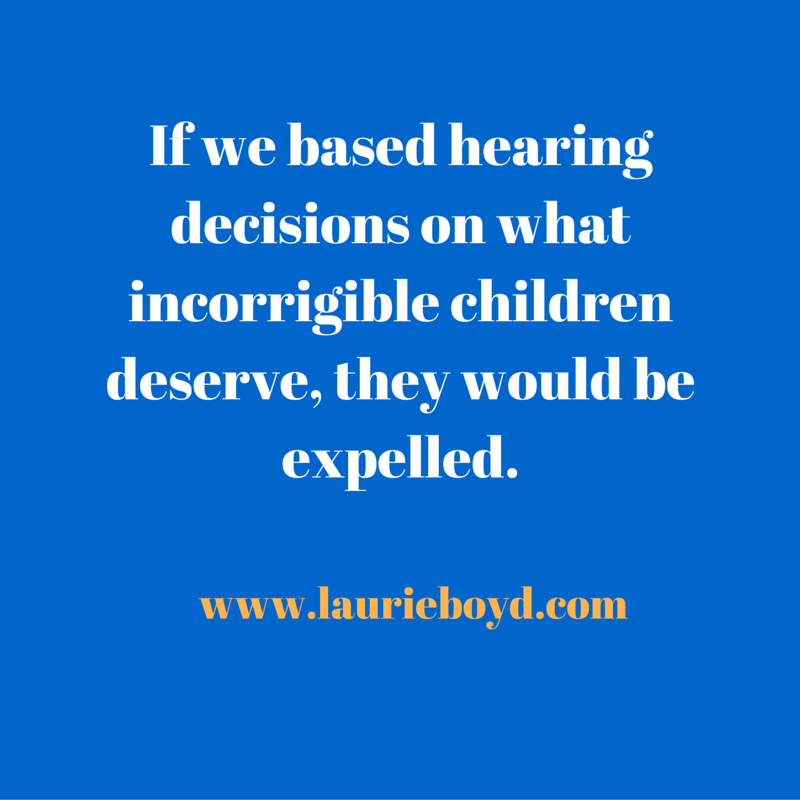 If we based hearing decisions on what incorrigible children deserve, they would be expelled. 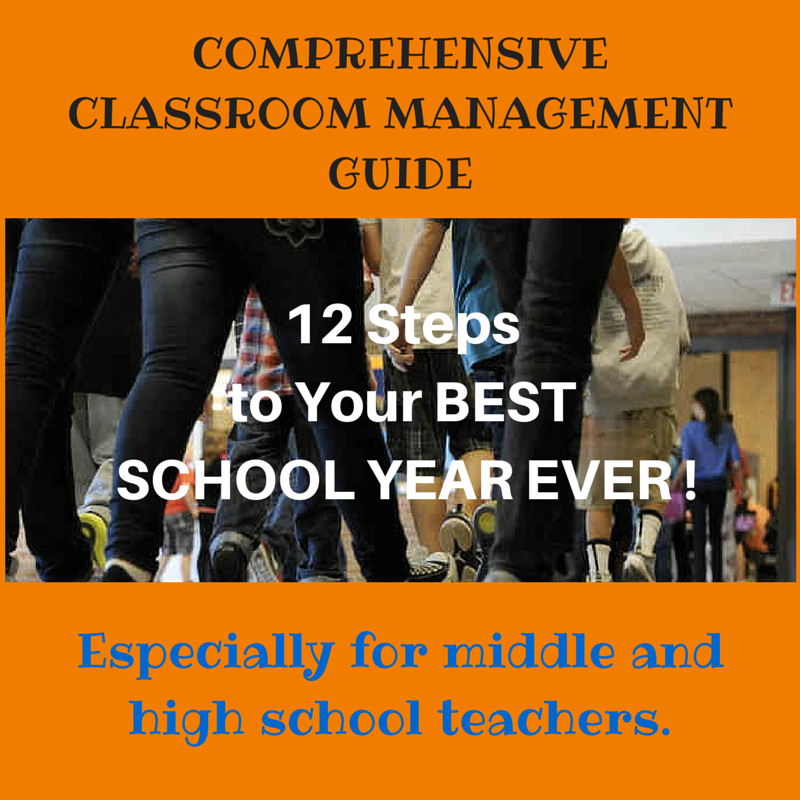 Level One includes four common procedures for every classroom, five common rules for every classroom, and the same four-step consequences for every classroom. Level Two involves the implementation of a research-based, proven model called the Behavior Intervention Support Team (BIST). Every teacher is trained and supported to implement the classroom-based components of BIST, including the way we speak to kids, movement of students within the classroom, and how to remove a student who is disruptive or hurtful. Level Three requires a specific behavior support plan that teaching teams develop with the student to help him or her develop one or more lifeskills to manage himself or herself, not only in school but also in life. This plan includes specific behavioral goals and monitoring mechanisms. Interventions include being shut down in one teacher’s classroom all day to work on a skill or to manage one’s behavior when he or she is out of control. Consequences that are needed to define limits include Out-of-Classroom Placement (OCP), Second Step Program (SSP), and Team Focus (TF). Students who refuse to do school work are taken through a sequence of more and more intrusive interventions to get them to put forth an effort and to learn to do what is necessary to pass their classes. 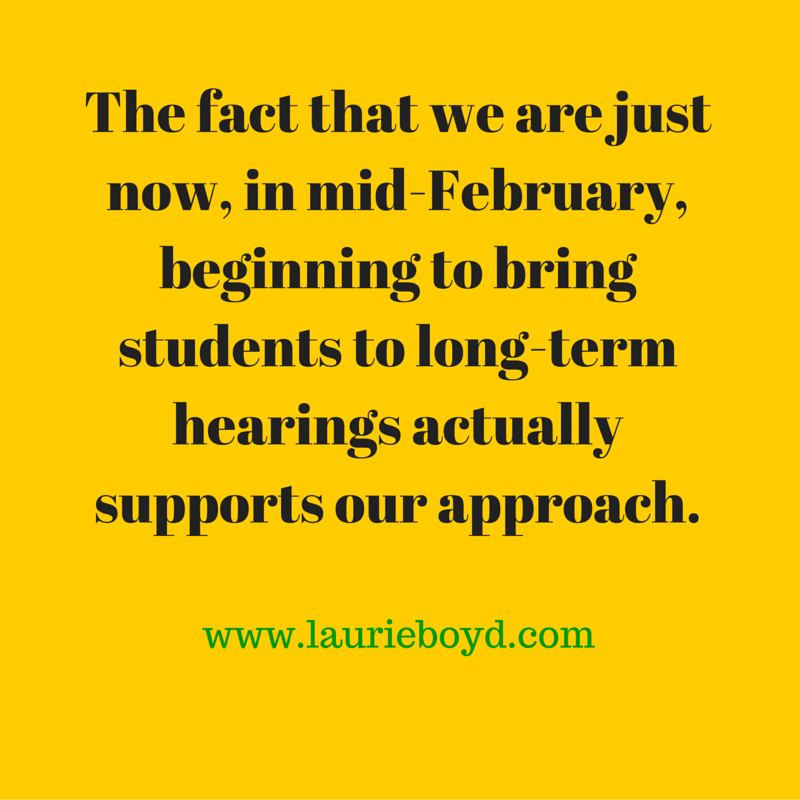 When students fail all interventions, it’s time for a hearing. Parents, of course, have been apprised of every intervention or consequence from the first incident, and many have tried to work with us to help their children. 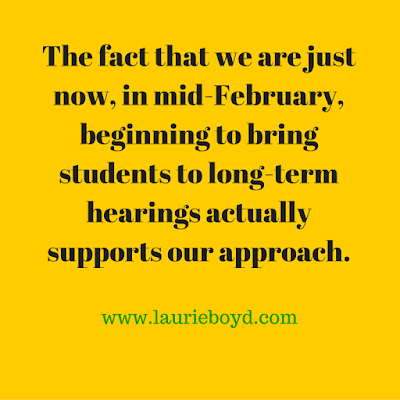 The fact that we are just now, in mid-February, beginning to bring students to long-term hearings actually supports our approach. It means that our interventions have enabled us to keep incorrigible kids in school through most of third quarter. We are not giving up on them or watching them fall through cracks. We are working with our struggling students in very defined protocols over significant periods of time. Many more students than the few who end up at hearings are engaged in and benefitting from these same interventions, different ones turning their behavior around at different junctures in the process. By the time students come to hearings at our school, neither they nor their parents are a bit surprised. Until a few years ago, we had nowhere for these students to go, and they were expelled for the remainder of the school year. But since we developed our on-site alternative school, which we call School Within a School, I can now offer the alternative school in lieu of that expulsion. So, my disciplinary hearings don’t bother us. They are a step along the path to what the student needs. 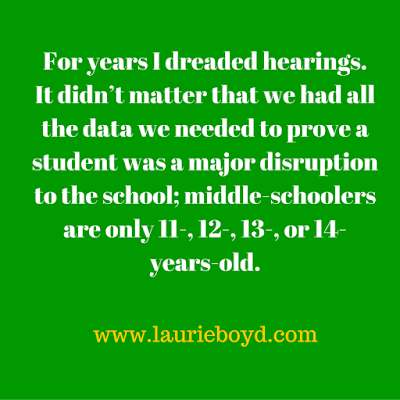 Often, the information we really need about a struggling student only comes to light at a hearing. More often than not, we finally get the partnership we need with the parent of a struggling student once we bring them to a hearing. 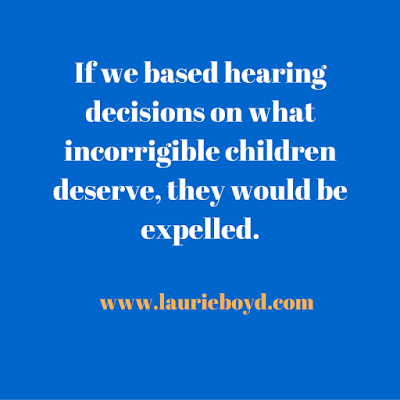 In our district, as in others, I assume, parents are allowed to appeal our hearing decisions. Because we implement so many interventions, communicating with parents and trying to partner with them every step of the way through those interventions, and because we provide an outstanding alternative program in our school, no one has appealed our hearing decisions in years. As an administrator, I finally feel like we have sufficient placements and programs for even our most incorrigible students. Our School Within a School delivers a true alternative to the regular classes that our struggling students cannot manage. In the past three years, we have not had to put even a handful of students out of school.